Images taken using an atomic force microscope have allowed researchers to observe, for the first time, the flexible and dynamic changes that occur on the surfaces of 'porous coordination polymer' crystals when guest molecules are introduced. The findings, published in the journal Nature Chemistry, have implications for investigations into materials that can be used for storing and sensing molecules. "We were surprised to find that the porous coordination polymer surface is exceptionally flexible and constantly fluctuating in solution," says Nobuhiko Hosono of Kyoto University's Institute for Integrated Cell-Material Sciences (iCeMS), "on the contrary to the common perception that the crystal is hard and immobile." Although researchers are aware some crystalline structures change when exposed to certain molecules, they hadn't yet been able to observe these changes in real-time. Seeing what actually happens can further studies into controlling these materials. The atomic force microscope is formed by a tiny probe at the end of a cantilever. The probe's movements over the surface of a material are recorded, providing an image of the material's topography. The surface of the coordination polymer crystal was first examined in solution under stable conditions. The metal-organic lattices on the surface were tetragonal in shape. A biphenyl solution was then added to the crystal with a gradually increasing concentration. Images were taken every 13 seconds. The team found that the lattices changed to a rhombic shape within ten minutes as the biphenyl concentration reached a maximum of 500 millimoles/litre of solution due to the molecule's combination with the crystalline surface. Decreasing the concentration lead to removal of the biphenyl from the material's surface and a rapid return of the lattices' tetragonal shapes. Further studies showed that the surface changes barely affected the rest of the crystal's structure. 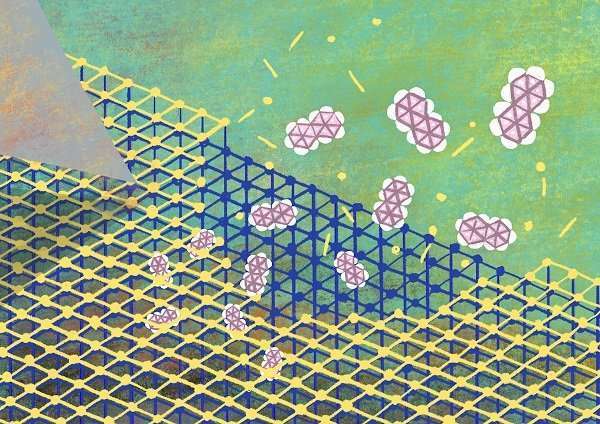 The highly responsive nature of the porous coordination polymer surface, captured in great detail, provides insight that can help guide responsive materials development, the researchers write in their paper.